Are you building a concrete patio? It will undoubtedly increase the resale value of your house. 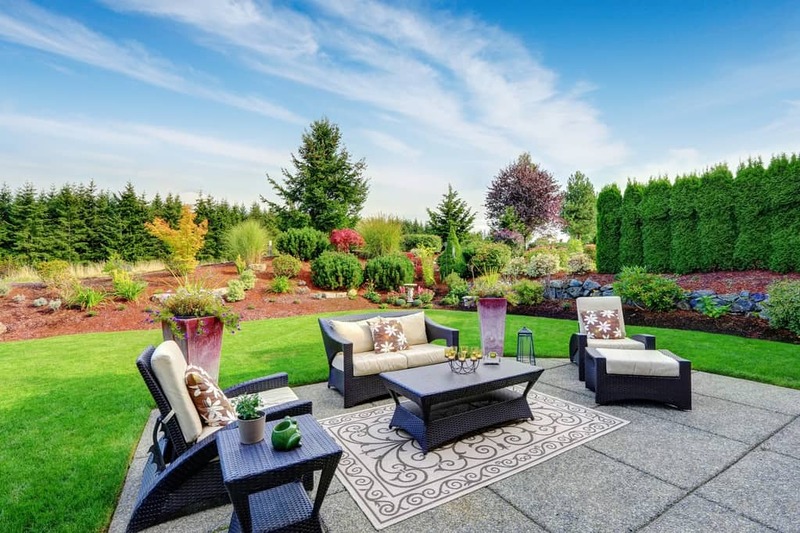 Did you know that over 54% of home buyers are willing to pay a premium for patios? It could mean the difference between a quick sale and a drawn-out negotiation. Unfortunately, building a patio is an intermediate level job. If you've never laid concrete, it can be a daunting task. You must track down everything from your local building codes to the right size trowel. Fortunately, you came to the right place. When you start your DIY concrete patio, you'll already know the top ten mistakes that trip up beginners. You'll also know the best ways to avoid them. First timers often neglect to properly check out the area they plan to lay their cement patio. This requires a visual inspection, some measurements, and a little bit of legwork. Head out to the area of your future patio. Visualize where you want it. Do you notice any obstructions? Is the ground even? Are there any other elements which may occlude your installation? Spend some time in the area. Take note of all the sights, sounds, and smells in the area. Can you change your patio's position or structure to improve a visitor's experience? Next, you'll need to find out where your septic tanks, underground lines, and other utilities are located. The final part of your survey involves checking with your city to find local building codes. You need to know how far your patio must be from your house and property lines. Keep a sharp eye out for details in your city or county regulations which might change your design. Begin by driving wooden stakes into the corners of your patio area. Then tie strings between stakes, outlining the area that will become your patio. If the area doesn't resemble the vision, you had in your head, adjust it. If your stakes are blunt, sharpen them. If the ground is uneven, you can either build one side up or dig one side out. If you're building it next to the house, adjust your patio height to your house. Then remove all weeds, topsoil, roots, grass and large rocks from the roped off area. We recommend using hoes and shovels for this labor-intensive work. Note: Don't be afraid to spend plenty of time on this step and the other prep work steps. Once you start pouring concrete, fixing mistakes becomes costly. If you want a patio level with the ground, you'll need to need to dig out the top 8 inches of soil. If you want a raised patio, you'll still have to dig. Fortunately, you'll only need to dig 4 inches down. Then compact the earth using a compression roller. It'll give you a solid surface for your concrete. Note: If you plan to put something extremely heavy on the patio, like a hot tub, you'll need to pour a concrete foundation first. Heavy objects require a footing. Otherwise, your concrete will crack. Next, you need to throw down a layer of crushed rock. The permeable material gives water a place to go during the wet season. Be sure to lay a solid four inches of the stuff. Beginners usually skimp and wonder why their concrete buckles during the wet season. Level it to a 1/8" per foot slope, and compact it using a compression roller. After that, drive stakes around your patio's new perimeter. Keep the sakes at least 2 feet apart and slightly outside your original stakes. Make sure to use sturdy stakes. Otherwise, they may bend or break from the pressure of heavy concrete. Cut 2x4s to build a frame inside the border of the hole you dug. This frame, otherwise known as a "form," will hold the wet concrete you pour. The inside of the form should be the exact dimensions you want your patio. Beginners often include the edge of the frame into their dimensions, so the patio ends up smaller than they'd planned. Afterward, align your 2x4s with the string border you build earlier. The boards should be directly underneath the string. When you finish, nail the boards to the stakes at a 1/8" per foot slope. Remember, the stakes and forms need to be sturdy enough to handle the weight of heavy concrete. Take the time to get it right. It'll be too late once you start pouring. Saw off the tops of your stakes, so they're just below the edge of your forms. Then coat the forms with either vegetable oil or a commercial releasing agent. You don't want your concrete to stick to the wood. If a contractor is dropping off a pre-mixed load of concrete, you can jump ahead to step 8. If not, read on. You can mix your concrete by hand (not recommended) or with a mixer. Follow the directions on your concrete mix, and pour the ingredients into your mixer. Then add the water and turn on the mixer. If you decided to do it by hand, you could achieve the same results by pouring the mix into a wheelbarrow. Then mix it with a shovel. Wear protective gloves and eyewear at all times. Concrete tends to splash, and it'll cause chemical burns if it lands on your skin. Note: to determine the amount of concrete you need, use a concrete calculator. Rookies make the mistake of slowly mixing and pouring the concrete. Experts do it quickly because they know it dries quickly. If you're building a large patio, grab some friends to help. Dump wheelbarrows full of concrete into your forms. Make certain not to bump the forms or roll directly over them. Instead, build a ramp using 2x4s or 2x8s. Concrete can also be sticky, so you may need at least two people to finish this job. One person can hold the wheelbarrow while the other shovels the concrete. Also, make sure to push your concrete into every corner. Concrete doesn't naturally level itself out like water. It'll dry in some strange patterns if you let it. Note: Wear rubber boots for this part. You'll be walking in the concrete which will destroy any other kind of footwear. Use an aluminum screed to level out the concrete. Start at one end of the patio. Then work your way to the other end, using a sawing motion. Do. Not. Drag. Your. Screed. The sawing motion will tamp down the crushed rock under the cement. Finish by using a bull float to smooth out the surface. Scrape the float back and forth to fill in any low spots. Water will float up to the surface. Wait until it disappears to finish the patio. Clean up the area and allow the concrete at least 24 hours to dry. After two weeks, apply at least two coats of concrete sealer to protect your new project from the elements. So, what's next? Well, you have two options. The first is to head down to your local hardware store and start buying up tools for the DIY concrete patio you're going to build tomorrow. The other approach (which we recommend for every one of you) is to continue with your research. Know every detail of each step for building your patio. Then it's time to begin price checking. If you're ordering concrete from a contractor, start there. It'll be your biggest cost. Then look into tools. Would it be less expensive to purchase your own, or to rent them? When you finish with that, it's time to start building. If you enjoyed this article, take five minutes to check out our related articles on all things concrete.